Mirror finish on the cabinet. Ramps, deck posts and width extension are options..
Takes a 45 foot container well. 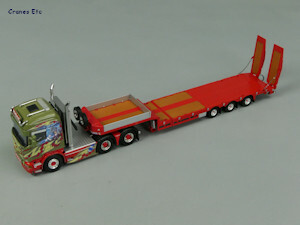 This is a model of a Scania Streamline Sleeper Cab 6x4 with a three axle semi-trailer. It is in the colours of Midtstøl, a Norwegian company founded in 1929. 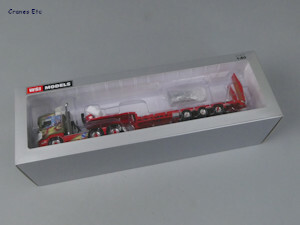 The model comes in the WSI Models branded box with a window and it is held between plastic formers. 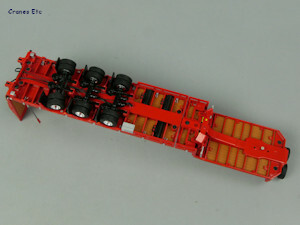 There are quite a few parts supplied for the trailer, but no instructions. 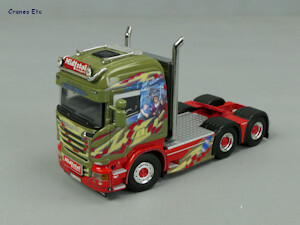 The tractor is a Scania 6x4 with a very detailed chassis. The wheels are nice, and there are different tyre tread patterns front and rear. The cab looks great in the Midtstøl colour scheme. There is a sign on the roof and the grille is particularly good. There is a realistic number plate, and the graphics are very high quality. Behind the cab, there is a mirror-finish cabinet with coiled lines, and twin chromed exhausts. The rear lights have individual plastic lenses. The trailer is highly detailed. 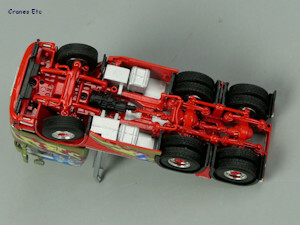 Underneath, the structure of the trailer is modelled well, with the axles having the suspension fully represented, and there are hoses running to each wheel. At the front there are a couple of landing legs. 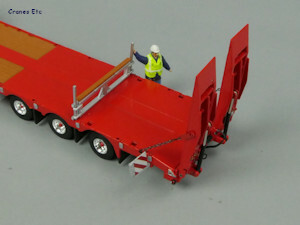 Rear legs for the loading ramps are modelled but are not functional. The surface of the trailer is very good with the screw holes modelled in the replica timber deck. 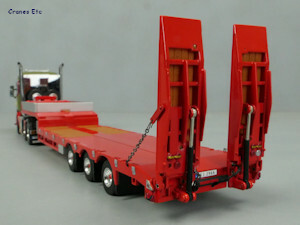 Details include some detailed 'micro' graphics on the gooseneck. On one side there is a control console box. 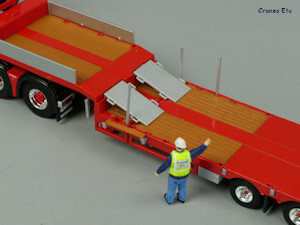 The loading ramps have a good structure and the rear lights are mounted on them. 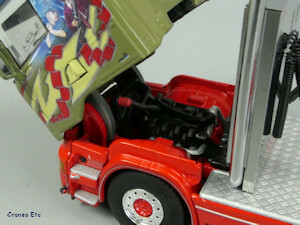 Fine gauge chains connect to the ramps. There is a number plate also. 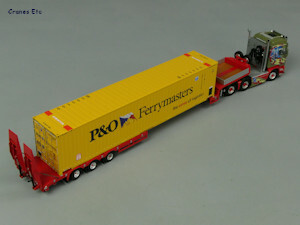 The trailer width can be extended with boards and there are also parts for securing a container. A pair of width markers loosely attaches at the rear end of the trailer if required, and a couple of pull-out ones are stowed under the gooseneck. 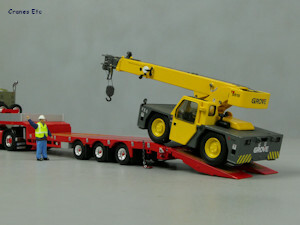 Loading plates for the gooseneck are included, as are deck posts and a support beam. 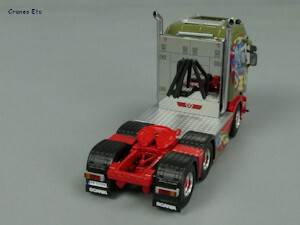 The Scania's steering has moderate movement for posing purposes. The model rolls nicely in a straight line. Under the tilting cab is a nice engine. The trailer has plenty of features. All the axles have effective working suspension with good movement, and the rear axle is linked with self-steering and can adopt a reasonable angle. The loading ramps can be lowered to make a good landing on the ground. At the front the landing legs can be screwed down with smooth sided pistons being revealed, and the marker boards stowed under the gooseneck can be slid into position. 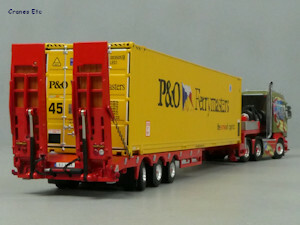 The trailer bed can be extended to almost double its length. For wider loads the trailer has a load floor width adjustment and this works with tiny extension beams which can be pulled out and then replica timber beams can be laid between them. Other configuration options are provided by the gooseneck storage. Locks for attaching shipping containers are also supplied, as is a transverse support beam. 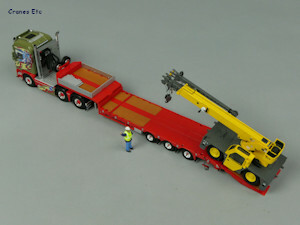 Loading plates for the gooseneck are also included. This is a very high quality truck model. 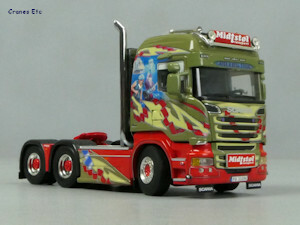 The paintwork and graphics are of a very high standard. This is a particularly good looking model because of the colour scheme. 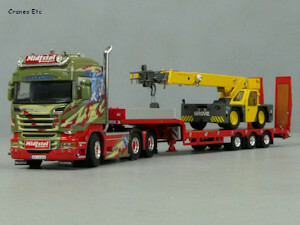 It will look very good when posed with the Tadano 5 axle crane in the same colour scheme which will appear later in 2019. The model appeared in March 2019. Moderate steering angle. The cab looks great.